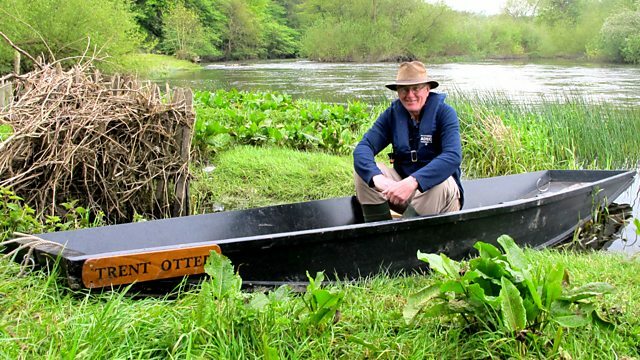 From the Staffordshire hills to the Humber estuary, spirited explorer Tom Fort embarks on a 170-mile journey down the River Trent on his own custom-built punt, the Trent Otter. From the Staffordshire hills to the Humber estuary, spirited explorer Tom Fort embarks on a 170-mile journey down Britain's third-longest river, the Trent. Beginning on foot, he soon transfers to his own custom-built punt, the Trent Otter, and rows many miles downstream. Along the way he encounters the power stations that generate much of the nation's electricity, veterans of the catastrophic floods of 1947, the 19th-century brewers of Burton and a Bronze Age boatman who once made a life along the river. I had thought long and hard about the craft for my adventures. She had to be light enough for me to manage on my own, and - at a pinch - to be transported for short distances overland. She had to be big enough to take me and my supplies, and for me to sleep in it should the necessity arise. At the same time she had to have the minimum possible draught so that she could be manoeuvred in shallow water. Most important of all, she had to be right for the river, aesthetically and philosophically. If a river could be pleased with a boat, this river had to be pleased with my boat. Those were the requirements. I took them to my friend Jon Beer, who - as well as being an exceedingly accomplished angler and writer - is enviably talented with his hands. I knew that he had designed and made a punt for skimming up and down the minuscule River Cherwell. So I asked him to make one for me, for the Trent, and he did: a punt, but no ordinary punt. She was fifteen and a half feet and a little more in length, three foot three inches in the beam, square-ended and flattish-bottomed but slender and sleek, made from sheets of plywood, with oak blocks at either end and a central mainframe of oak to hold her together. She was, and is – tough, durable, manoeuvrable and marvellously elegant: a boat for one man. One man and his boat. I had painted her a soothing olive green, and as I walked down the A34 to renew acquaintance with her, I decided that she should be known as the Trent Otter. This was partly because the creatures were obviously about, but more to honour a long-departed angler called J.W.Martin, who used the pseudonym ‘Trent Otter’ for a series of books with titles like My Fishing Days and Fishing Ways and Days Among the Pike and Perch. He had long been a favourite of mine. Tom’s passions include fishing and cricket, and his enthusiasms include playing the piano, pubs and rugby union.